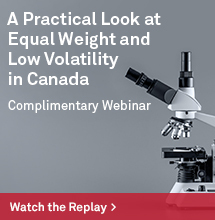 Indexing provides many rewards, including a reduction in volatility. 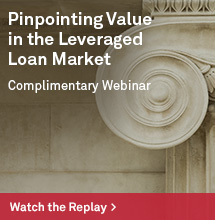 Asset owners should demand higher returns to justify the volatility that active management entails. For managers who put their stock selection skills to the test, it is worth understanding the height of the volatility hurdle in managing a portfolio’s risk/return profile. 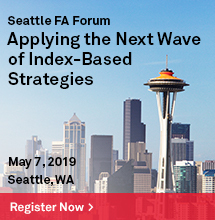 We can illustrate this by considering the volatility of a sector index, which, like that of any portfolio, is contingent upon the weights, volatilities, and correlations of its constituents. In particular, the lower the correlations, the greater the reduction in volatility between the constituents and the portfolio will be. 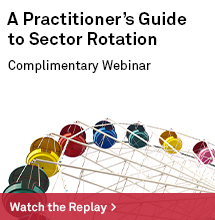 Exhibit 1 illustrates this for the S&P 500® and its 11 component sectors. 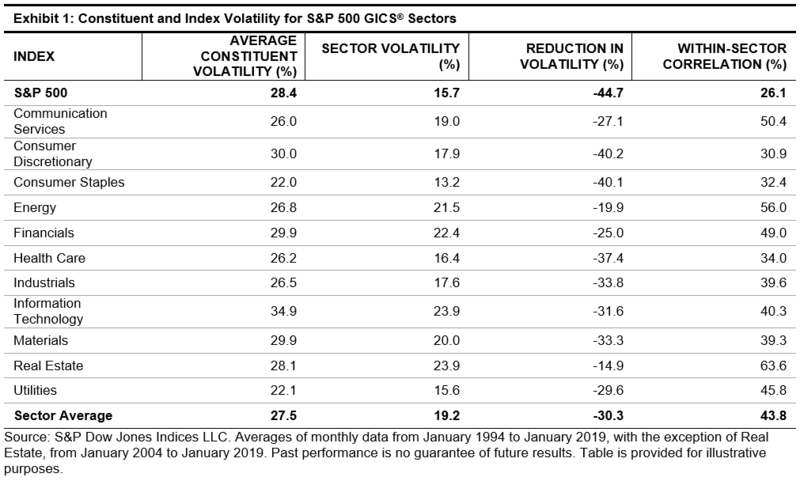 The S&P 500 is 45% less volatile than its constituent stocks, while the average sector index reduces component volatility by 30%. This effect is more pronounced in certain sectors, such as Consumer Discretionary, Consumer Staples, and Health Care, which have relatively low within-sector correlations. A portfolio manager can own an entire sector or, alternatively, own only a small number of her favorite stocks. Buying individual stocks typically requires assuming more volatility, which implies an expectation of higher returns. But how much higher? Consider: the Utilities sector historically returned 7.8% annually, which implies 0.50 units of return for every unit of risk. The average Utilities stock is more volatile (22.1%) than the sector as a whole (15.6%). To maintain a constant 0.50 return/risk ratio, the average stock would need to return 3.3% more than the sector as a whole. Exhibit 2 applies this logic to the S&P 500 and to each individual sector. The required incremental return is greatest in Consumer Discretionary, Consumer Staples, and Health Care, all of which have below-average within-sector correlations. At the other extreme lies Real Estate, where within-sector correlations are quite high. How likely is it that the required returns from Exhibit 2 are actually attainable? Dispersion, or the spread among returns in a sector, indicates how challenging it might be for managers to generate this incremental return. 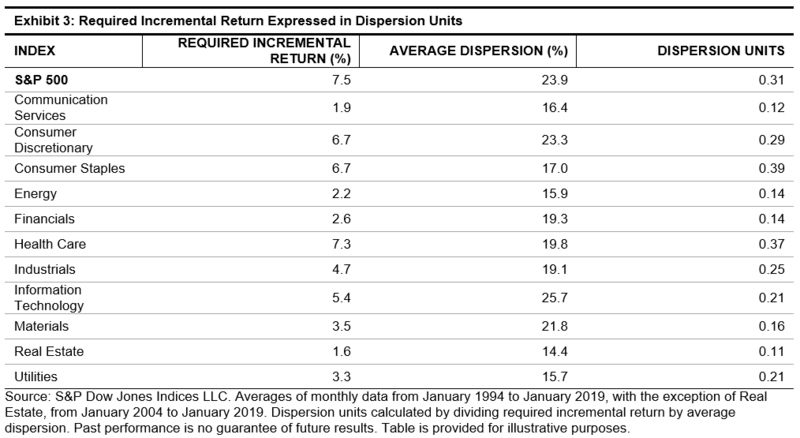 For the Utilities sector, the 3.3% incremental return amounts to 0.21 “dispersion units” (or, roughly speaking, a stock return 0.21 standard deviations above the sector mean). Exhibit 3 makes this comparison for all sectors. Consumer Staples and Health Care stand out as particularly challenging. 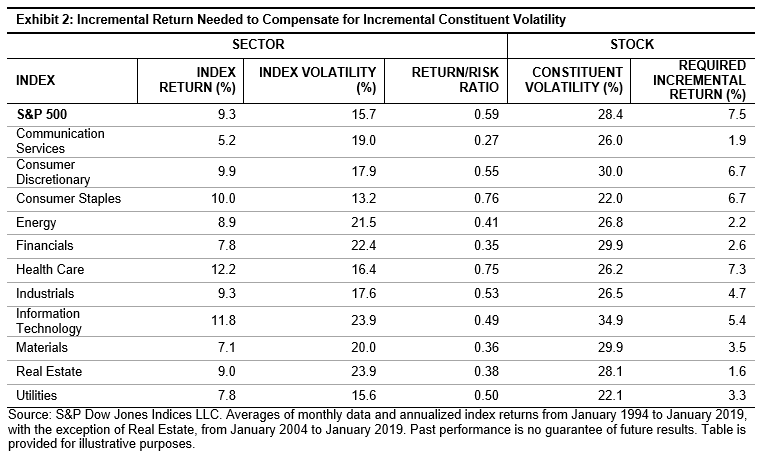 In these sectors, fewer stocks will generate the return sufficient to justify a concentrated position. Stock selection within sectors entails the possibility of higher returns, but the probability of higher volatility. This framework helps understand within which sectors that incremental volatility is most likely to be justified.